The practice of urgent care medicine took off in the 1990s. It was driven by a reduction in the number of primary care appointments available and frustration over long waits in the emergency room. People’s desire for immediate access to healthcare has only increased over the years, causing exponential growth in this sector. Today more and more practices and facilities are taking the convenience factor of urgent care to the next level by adding the option of video visits. The approach is being adopted by urgent care clinics that want to increase market share, earn more revenue per provider, and lower the costs of delivering care. Primary care practices also see video visits as a way to compete with retail clinics and online health services providers. What Types of Urgent Care Cases are Treated via Video? The treatment plan for a patient presenting with cold or flu symptoms is often rest and hydration. What the patient gets the most out of these types of visits is reassurance that the problem isn’t more severe. Video visits can easily be used to provide care instructions and comfort. This saves the patient the effort of getting into the office when they don’t feel well and helps prevent the spread of viruses. UTIs and yeast infections are regularly treated via telemedicine, especially for patients with an established medical history with their provider. Patients can be prescribed the appropriate medications and get advice about what changes in symptoms should trigger an in-office or emergency room visit. Modern telemedicine technology leverages high-resolution video, so it is frequently possible to diagnose and treat some skin conditions. For patients, urgent care visits are just that – urgent. That means that there isn’t an opportunity to plan for transportation, child care, time away from work and so on. That’s why video visits are ideal for urgent care situations. Patients get the help they need without a significant disruption to their other responsibilities. Patients are also able to avoid unnecessary visits to the emergency room, while still receiving timely care by using a remote encounter instead. In addition, video visits help stop the spread of illness by eliminating exposure to other sick patients. What are the Benefits for Providers? Urgent care practices that see some patients via video can see more patients each day, thus increasing practice efficiency and revenue without the need to hire additional providers or staff. 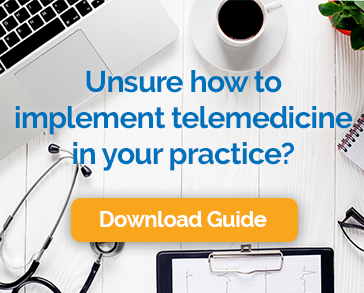 Telemedicine helps reduce wait times and even out the flow of appointments across the day. Some practices also find that they can expand the nature of services they offer to patients. Primary care practices find that the addition of remote visits for urgent care helps them maintain patient loyalty and better compete against the expanding options for urgent care available to their patients. Urgent care clinics and primary practices that consider adding the option of video visits should choose their technology platform with carefully. There are a few critical capabilities to consider. It is essential to apply the same standard of care to a video visit as an in-office one, so the reliability and performance of the technology used to deliver audio and video is essential. Many healthcare facilities have less than optimal internet connectivity, so look for a solution designed to function well even under these conditions. The privacy and security rules under HIPAA don’t change when a visit is conducted remotely, so only those solutions with built-in compliance and data encryption should be considered. Many insurers provide reimbursement for video visits, and more than thirty states require that they do so. Some telemedicine solutions include insurance verification so that you can be sure that each remote visit will be billable. The best solutions even provide a reimbursement guarantee. Integration with the EHR or practice management solution ranks high on the list of telemedicine requirements. This integration eliminates duplicate data entry and streamlines appointment setting and billing. Telemedicine has the potential to help overcome some of the most pressing challenges in the American healthcare system. It is particularly well suited for the delivery of urgent care in a way that is cost-effective, convenient, and capable of producing the desired health outcomes. That’s something that everyone can get excited about.